Does raising the debt ceiling "increase our debt"? By Louis Jacobson on Monday, October 14th, 2013 at 3:44 p.m.
President Barack Obama speaks during a press conference at the White House on Oct. 8, 2013. The media availability was held in the midst of a government shutdown and worries over the debt ceiling. 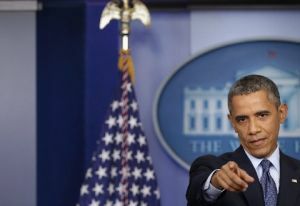 With a possible federal default looming, President Barack Obama used a portion of a recent news conference to explain exactly what was at stake if Congress didn’t move to lift the limit on how much the federal government can borrow. At the Oct. 8, 2013, press conference, Obama sought to dispel the perception that raising the debt ceiling amounts to a blank check for further spending. However, Obama continued, raising the debt ceiling "does not increase our debt. It does not grow our deficits. It does not allow for a single dime of increased spending. All it does is allow the Treasury Department to pay for what Congress has already spent." Several readers asked us to check whether it’s accurate that raising the debt ceiling "does not increase our debt. It does not grow our deficits. It does not allow for a single dime of increased spending." Ultimately, we decided that we couldn't put this comment to the Truth-O-Meter, for several reasons. One was that a debt-ceiling breach has never occurred before, so to some extent, we'd be speculating on a future event. In addition, it's tricky to define "spending" in this context, and the definition we'd use would have a big impact on how accurate the statement would be according to the Truth-O-Meter. For instance, if the debt ceiling is like the limit on your credit card, then does the "spending" happen when you swipe your card at the cash register? Or is it at home, a month later, when you pay the bill? That said, the issues Obama raised are important ones for the looming debt-ceiling situation, and in discussing the issue with experts, we determined that his abbreviated explanation at the press conference left out some important issues. So we'll go through the issues here. Experts we spoke to agreed that Obama is on safe ground when he says that raising the debt ceiling "does not increase our debt. It does not grow our deficits." Obama is correct that the debt ceiling addresses debt, not spending -- at least not directly. Raising the debt ceiling allows the United States government to borrow funds that cover the obligations the government has already incurred. It doesn’t by itself prompt any new spending: Congress and the president must separately sign off on any new federal spending commitments. Put simply, the United States has chosen to divorce spending and financing decisions. In fact, raising the debt ceiling is a necessary condition for eventually raising spending without a default. Spending can only be raised in the future if the debt ceiling is raised (or if progress is made on paying down the existing debt, something that’s rarely happened in recent decades). Without a debt ceiling hike, Congress and the president would find their hands tied if they ever wanted to make any new financial commitments. So, contrary to what Obama said, if the the debt ceiling is raised high enough, it does, in fact, "allow" for additional spending. It just doesn’t demand it. "Clearly, raising the debt ceiling does not in and of itself increase the debt or grow the deficit," said Steve Ellis, vice president of Taxpayers for Common Sense. "But to say that it doesn’t allow for a dime of increased spending is misleading. When the credit card company increases my credit limit, it doesn’t increase my debt load or even my spending. But it certainly facilitates it. The same is true with the debt ceiling." Satya Thallam, director of financial services policy with the the center-right American Action Forum, concurred, saying that while the debt ceiling has "little to do with the present," it has "everything to do with future potentials." Thallam said the debt ceiling can be perceived as a prerequisite for future spending -- though a better term, he said, may be "post-requisite." "It’s like signing a contract to purchase new furniture, and then going to your credit card company and asking for a credit limit increase to cover the amount," he said. The debt ceiling "doesn't lead to additional spending, but it does risk the possibility that you won't be able to pay." Not that the threat of the debt ceiling has scared off Congress from spending in the past. "Congress has passed budgets knowing that the borrowing to follow through on their budget commitments would exceed the debt ceiling," said Tara Sinclair, a George Washington University economist. "I wish they treated it as a prerequisite, but instead they go ahead and spend and then find themselves at risk of defaulting on obligations. If they were limited by the debt ceiling in terms of planning the budget, then that would be different, but they appear not to be."